The California quail (Callipepla californica), also known as the California valley quail or valley quail, is a small ground-dwelling bird in the New World quail family. These birds have a curving crest or plume, made of six feathers, that droops forward: black in males and brown in females; the flanks are brown with white streaks. Males have a dark brown cap and a black face with a brown back, a grey-blue chest and a light brown belly. Females and immature birds are mainly grey-brown with a light-colored belly. 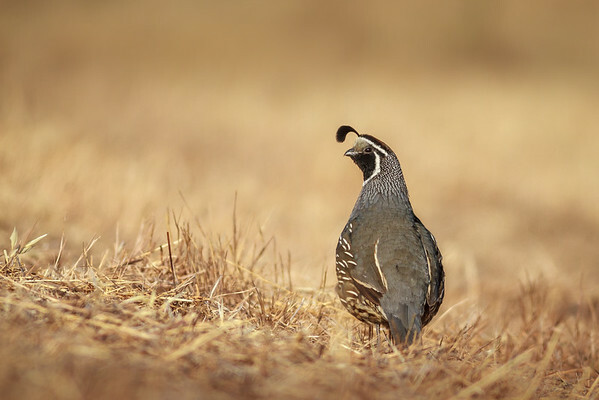 Their closest relative is Gambel's quail which has a more southerly distribution and, a longer crest at 2.5 in (6.4 cm), a brighter head and a scalier appearance. The two species separated about 1–2 million years ago, during the Late Pliocene or Early Pleistocene. It is the state bird of California.